The correct answer is C. Congratulations to all you connoisseurs of creepy! 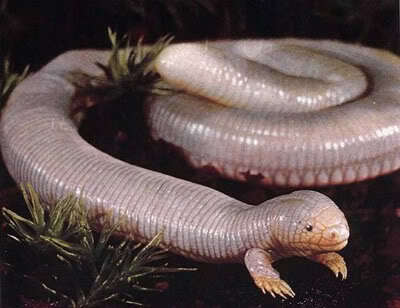 The Ajolote Lizard aka the Mexican Mole Lizard lives mainly underground eating worms and other insects. This reptile can be found only in the Baja California peninsula in Mexico – if you happen to go there on vacation, get to the wild and start overturning rocks and digging lightly around the mesquite. It’s actually pretty cute in the video. Like a big earthworm with tiny clumsy arms.